These are in PDF format at 300 dpi so they print out very nicely. 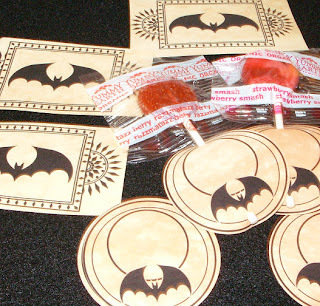 I used a 2 inch circle punch to punch out the circle tags, and then a 1/8 inch hole punch to punch holes to slide a lollipop stick through. But you don't have to use them for lollipops. The lollipops are YummyEarth Organic Vitamin C pops which both my teens love. My prints are done on TerraCycle's coffee paper which has a nice stained look to it naturally. You can download the rectangle labels here and the circle tags here. These are so pretty, I love bats! Thanks so much, I'll be linking.